Sesame-Soy Salmon with Ginger Honey Glaze - Gutom Na! Posted on Friday, August 14th, 2015 at 1:00 pm. In a bowl combine olive oil, sesame oil, soy sauce, garlic, ginger, vinegar, and brown sugar. Whisk well until combined. 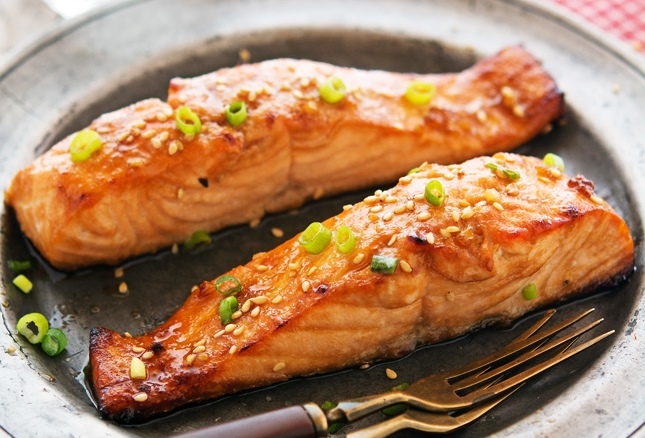 In a shallow sealable container or in a large Ziploc bag, combine salmon and marinade. Cover or seal and marinate in the refrigerator for 30 minutes. In the meantime in a small bowl combine all glaze ingredients. Set aside. Preheat the broiler in your oven to high and place a rack in the middle. Line a baking sheet with aluminium foil and lightly grease with olive oil. Remove the chicken from the marinade and place onto the lined baking sheet. Sprinkle with a bit of salt and pepper and place under the broiler. Cook for 10 minutes. Remove and brush the top with glaze. Cook for further 2 minutes or until opaque and easily flakable with a fork. Remove immediately, sprinkle with toasted sesame seeds and chopped scallions if desired, and serve.